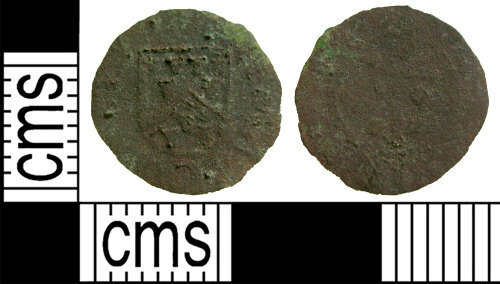 A post medieval token of possibly Thomas Chapman of Walkern, Hertfordshire, dated 1667; Williamson no. 199 (1967, p. 328). The token's surfaces are very worn and corroded. The reverse legend is illegible, but the obverse appears to read THOMAS CO[...]. However no parallel with a 'grocer's arms' obverse appears in Williamson for the surrounding counties. It measures 13.58mm in diameter, 0.49mm thick and weighs 0.31g. Obverse inscription: [...]MAS CO[...] The O is worn and may perhaps be an H.